But this article is about 2011, and if we're talking 2011 and Stuart Immonen, then we have to talk about Marvel's big-event, Fear Itself. 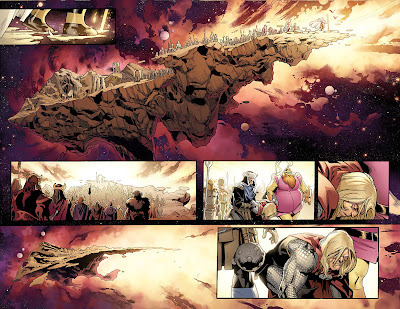 In this series, Immonen showed his incredible versatility, capturing expansive cosmic landscapes in a breath-taking manner emphasizing their vastness and their beauty, while at the same time capturing the emotional breadth of the human face and its ability to convey fear, sadness, awe, or disdain. The fact that he so deftly dealt with the huge number of characters involved in this company-wide cross over alone should make him one of the top artists of 2011. Add to this the facts that his lines are always clean, his layouts are always spot-on, his pacing is always impeccable, and his style is so distinctive absolutely puts Stuart Immonen in the top two of 2011.